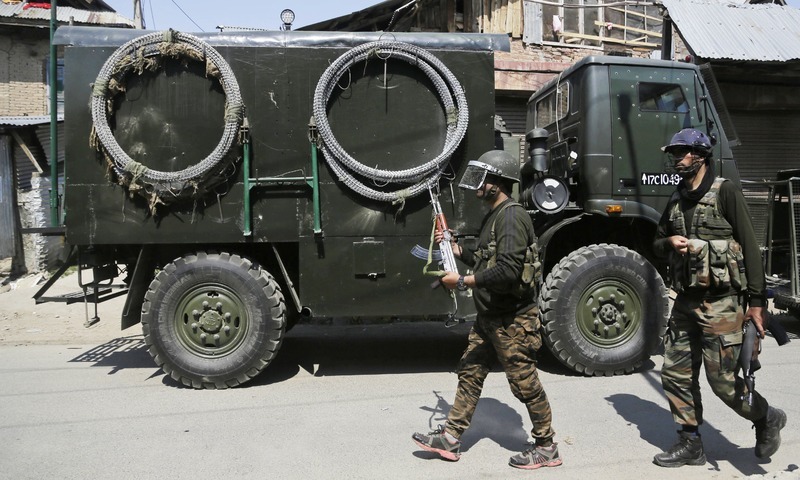 A security clampdown and a strike sponsored by separatists fighting against Indian rule shut most of India-held Kashmir on Monday, a day after deadly protests and fierce fighting killed 16 combatants — 3 Indian soldiers and 13 suspected militants — and four civilians. 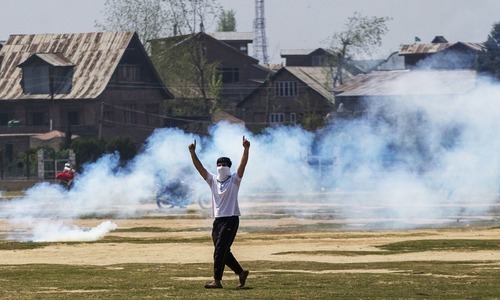 Authorities have also clamped a curfew in the old parts of Kashmir's main city of Srinagar, the urban centre of protests and clashes against Indian rule. According to Times of India, internet service has also been suspended in the area. The foreign minister termed Sunday the "worst day of state terrorism in Kashmir valley". "Movement that is rooted in heart and soul of a people and represent their innermost aspirations and a struggle for identity, cannot be crushed with the physical might," Punjab Chief Minister Shahbaz Sharif said. "New phase in the Kashmiris’ struggle for right to self-determination is inspired by legendary valour of Burhran Wani." 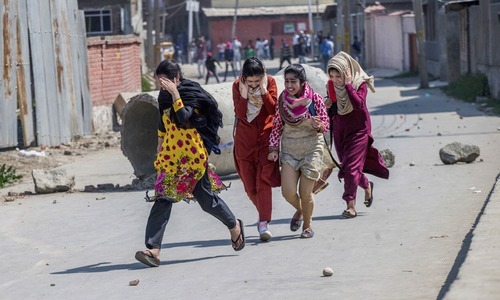 Foreign Office spokesman Dr Faisal had said that "this mindless killing spree had exposed, yet again, the ugly, inhuman face of the state-terrorism that India had been perpetrating against the Kashmiris for decades". Modi following the footsteps of Netanyahu. However, both will ultimately fail in future. No usurper and the oppressive nation can defeat indomitable Palestinians and Kashmiris. Militancy has no place in civilized world. Killings, killings and more killings of the helpless, happless and innocent civilians including women and children on a consistent and persistent basis since last 71 years by the brutal, merciless and barbaric Indian army is on-going in the India-held and India-occupied Jammu and Kashmir, while the global champions of human rights, true justice, equality, independence,, freedom of choice and self-determination are taking a deliberate nap. What a grave and great tragedy? Innocent people are being killed in Kashmir because of Indian terrorism. The international community and the United nation must take serious notice before it's too late. India is also sponsoring and backing terrorism in Pakistan for the last many years. 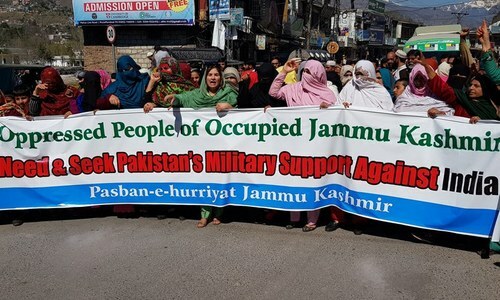 Dont know when India ends use of force and killings against Innocent Kashmirs only to have their support. Perhaps this is to do with India's culture where women are forced/ others are forced to accept demands by force, torture, killings. Also Many a times Indians use force to convert people to different religions, but foolish are they as can anyone change religion merely through tongue, its the heart that needs to be changed and its changed by use of logic and acceptance. Similarly, the use of same Indian culture and use of force can not turn Kashmirs to start supporting you. Leave it ! So called "World's biggest democracy" imposing their will forcefully n brutally on a human population against thier aspirations in broad day light for the whole world to witness! India is not a democracy, it a country built on the mass murder of innocent people. Where are the liberal Indians, where are they hiding, do they not care if the victims are Muslims. Shame on India for murdering innocent people in the OCCUPIED Kashmir. @Swetha - Oppression and brutality are not part of a civilized world. They always give birth to resistance. Instead of this..Kashmiri must be fighting for children's education, development, industrialization, infra structures issues....what they gets from such protest every years..?? What should Pakistani government do to a section of her citizen who pick up arms against the state? I think if you answer that question honestly you will start respecting Indian army and government for the patience. 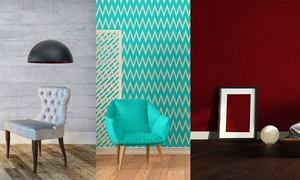 @Dove n Olive everyone has right to dream so do u. Keep dreaming. Violence cannot lead to any solutions. @Kishan - Thank you for such realistic thought amongst the lot of modi-mania. @Dove n Olive Just watch. Think and ponder "No word in any of the International networks"
i can see many comments from Pakistanis condemning the deaths . However kindly note that most of the killed were militants . Besides one of the Indian Military commander did an extraordinary step and called one of the militant's family in order to peruse him for surrendering . Instead he started firing on Indian Army and he needed to be killed .So every story has different sides . Request all my Pakistani and Indian friends to not take sides and view the news as impartially as possible and draw fact based conclusions. But we are not talking about the civilized world, we are talking about India. Where is the so called United Nations. Sleeping as usual. One has to take matters in his hands now. Enough is enough. India is the biggest supporter of terrorism and kills innocent Kashmiri civilians at will every single day. Shame shame India. Shame on people who support terrorism and then say why nobody believe us. @Sachin Indian security forces are slaughtering Kashmiris and you are telling us that infiltrators are creating problem. Why so many ladies, girls, old men are also protesting in the streets and Indian security forces are directly shooting at them. PM Modi is responsible for the blood shed in Kashmir. This cannot continue. The oppressive regime of Hindutva 's kingpin, Narendra Modi 's policy is akin to Netanyahu. Kashmiris and Palestinians are the victims of two unparallel brutalities. Militancy has no place in this world. Indian police is now being trained in Israel with the same tactics taught as being executed on the Palestinians. There are real exercises that take place in Israel during the training where the Palestinians are provoked and the protests starts only to train such forces coming for riot control. The same tactics are now being used all over India, specially on Muslim dominated areas. This is going to get worse before any real relief to the victims. Every Kashmiri is suffering but we will never give into oppression and occupation. Never.